Dual-major Computer Science/Computer Engineering senior Joe Rowley has been selected by the Baskin School of Engineering to receive the inaugural Ira and Kate Pohl Endowed Scholarship. 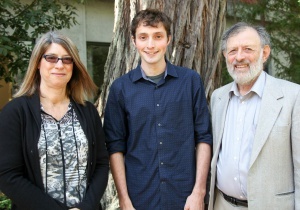 Professor Emeritus of Computer Science Ira Pohl and his wife Kate Rosenbloom Pohl, Software Developer for the UC Santa Cruz Center for Biomolecular Science and Engineering, created the scholarship to recognize and support outstanding undergraduate students who are committed to using computer science for social good. "This award is to encourage students to pursue computer science for the social good in the broadest terms." Joe Rowley clearly embodies that description. He first began to understand the impact that science can have on the world around him as a freshman in Professor James Davis’ class, Software for Society. Joe learned about the challenges faced by the global health care community working in poor countries with scarce resources. As part the class, Joe and his classmate performed comparative software analysis for a company called Health Records for Everyone (HR4E), a nonprofit organization dedicated to providing access to health data, information and knowledge to improve healthcare worldwide.
" ... along with increased access to education, improving health care is one of the most effective ways to improve quality of life." Joe first met the founder of HR4E, Dr. Phil Strong, while enrolled in Software for Society, and had the opportunity to travel to Ethiopia and learn first-hand about the issues faced by healthcare systems in extremely poor communities. While abroad, Joe created a pregnancy wheel app adapted for Ethiopia’s 13-month calendar, giving healthcare providers the ability to more accurately calculate due dates, monitor key trimester milestones, and track other important fetal statistics -- information vital to providing crucial prenatal care and ultimately resulting in healthier pregnancies. After returning from Ethiopia, Joe joined the core development team at Sana, a global health informatics organization at MIT. Sana focuses on innovating sustainable technology solutions to improve the access and quality of healthcare in rural and economically disadvantaged communities. Joe and his team worked with Sana’s open source mobile platform to create Protocol Builder, a tool that enables clinicians to utilize questionnaires on smart phones in the field to more quickly and accurately diagnose patients. Joe is well on his way to having a positive impact in the way the world provides healthcare to the poorest and most remote societies. He is an excellent choice for the Ira and Kate Pohl Scholarship and will be a great example to future recipients. “I am humbled and quite excited to have been selected for this scholarship. For me, this scholarship is exciting as it recognizes that many societal problems deserve the focus of computer science,” said Joe. Ira and Kate Pohl have given generously toward the goal of raising $25,000 to create a self-sustaining endowed scholarship. If you want to support outstanding, civically engaged students like Joe, please consider making a gift to the Ira and Kate Pohl Endowed Scholarship fund. Your contribution will allow BSOE to provide financial support to students like Joe for years to come. For more information, contact Tim Bensch, BSOE Director of Development at tbensch@ucsc.edu or 831-459-4572.